Hello video programmers! It’s Andy Gesner and the staff from HIP Video Promo with another outstanding video from our friends at Saddle Creek. A few months ago, we had the privilege of working the video for “First Day Of My Life”, the first clip from I’m Wide Awake, It’s Morningby Bright Eyes. That the response to the video was overwhelming wasn’t surprising – Conor Oberst inspires those kinds of emotions in casual and long-time listeners alike. But it would be disingenuous to say that the success of “First Day” engendered a demand for another Bright Eyes clip. Truth is, there is always a demand for another Bright Eyes clip. For Oberst’s fans, too much is never enough. Is Bright Eyes the most important independent artist in America? He is certainly one of the most renowned, selling out concert halls across the country, and connecting with fans who don’t ordinarily listen to indie music. By now, even casual music listeners know that Bright Eyes released not one but two excellent albums at the beginning of 2005, and that both have sold at a rate that the vast majority of musicians – indie or otherwise – would never dare to dream of. I’m Wide Awake, It’s Morning is the traditional singer-songwriter record: ravaged, stark, confessional and Dylanesque, it captures Oberst’s move from Nebraska to New York City with unerring precision and savage honesty. Digital Ash In A Digital Urn is also a conceptually-unified record, but the ideas and concepts are not quite as overt. If Wide Awake stood in the sunshine with flags flying, Digital Ash is a night-time analogue, covering much of the same territory, but approaching it at oblique angles, from shadows thrown by moonlight. It is not, as has frequently been written, Oberst’s electronica album, or an attempt to mimic the textures of The Postal Service. While the album incorporates synthesizers and samples, it does so to change the tone and feel of Bright Eyes’ songs, and to underscore subtle shifts in sentiment. The effect can suggest the most confessional and Romantic elements of new wave – but then Bright Eyes has always understood the evocative power of Eighties music. Enlisting Nick Zinner of the Yeah Yeah Yeahs to help craft these synthscapes virtually insured that Digital Ash In A Digital Urn would have a bare-bones, post-punk feel. No matter how many electronic instruments were used, not an ounce of the famous Bright Eyes immediacy has been sacrificed. 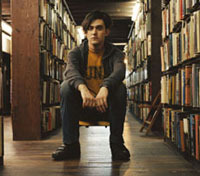 “Easy/Lucky/Free”, the final track on Digital Ash, is a perfect example of Oberst’s ability to play with arrangement expectations to make a musical point. A sweeping romantic ballad, it evokes the grand passions of teen soundtrack music – but this isn’t a love song; not exactly, anyway. Like much of Digital Ash and Wide Awake, it’s an intensely personal piece about the emotional discomfort of life during wartime. “I hear the crowd count down until the bomb gets dropped,” sings a frightened-sounding Oberst in that cracked voice of his, “I always figured there’d be time enough.” It’s a relationship song, of course – but that Bright Eyes traces the contours of that relationship against the stark black backdrop of violence and betrayal, blood and bombs. The video for “Easy/Lucky/Free” shows Oberst in all his ambiguous glory; standing stoop-shouldered in an empty apartment, walking nervously forward, producing a magic marker, and then, as if animated by the spirit of language, somehow scrawling words on the screen in front of us. As the song plays, he scribbles lines from it – underlining and changing his letter size for emphasis, pausing from time to time, doubling back, borrowing the spaces between words for extra observations. He draws pictures. He crouches and searches for empty space. He writes diagonally; chaotically, impulsively – yet he stays self-possessed. It’s a remarkable glimpse into the writing process of a great mobilizer of language and sentiment: a self-portrait literally painted in words. We couldn’t be happier to be working with all the cool folks at Saddle Creek and Bright Eyes again. He is an artist that commands your attention and we are here for you to make sure all of your Bright Eyes needs are taken care of in a timely fashion. If you need more info call Andy Gesner at 732-613-1779, or email HIPVideo@aol.com. You can also visitwww.saddle-creek.com to find out more about Bright Eyes.